Apple's announcements this week of refreshed iMac desktops, including a new $5,000 iMac Pro workstation promised to ship before year's end, and performance improvements to the MacBook Pro notebook line, were powerful rejoinders to critics who last year questioned the company's commitment to the commercial segment of its customer base, analysts said. "We haven't seen everything yet, but based on what they talked about, my guess is that this will address 99% of the needs of professionals," said Jan Dawson of Jackdaw Research, in an interview. Dawson was referring to the two-hour keynote that opened Apple's Worldwide Developers Conference (WWDC) on Monday, when company executives, including CEO Tim Cook, laid out the usual -- upgrades to both iOS and macOS -- but also spent time touting hardware, something the company hadn't done at the event since 2013. Although Apple updated the MacBook and MacBook Pro notebooks with seventh-generation Intel processors -- the architecture dubbed "Kaby Lake" by the California-based silicon designer and manufacturer -- talk during the keynote was limited to the iMac, Apple's all-in-one desktop. The refreshed iMac line features Kaby Lake CPUs across the board, brighter displays, faster SSD (solid-state drive) storage and graphics improvements that Apple claimed brought a three-times performance improvement to the smaller 21.5-in. systems. Apple added a new model boasting a high-resolution "Retina" screen to the 21.5-in. segment, made the Fusion drive -- a hybrid that combines both a traditional platter hard drive with a small SSD -- standard on all 27-in. models, and offered configurations of the latter with as much as 64GB of RAM. Apple also previewed the iMac Pro, a top-of-the-line model that will go on sale in December. The Cupertino, Calif. company rarely talks up products that will not shortly reach stores, but has been breaking that tradition of late. "This is the most powerful Mac we've ever made," said Phil Schiller, Apple's head of marketing, about the iMac Pro. Starting at US$4,999, the iMac Pro will be configurable with up to 128GB of RAM and as much as 4TB of silicon-based storage, while the Xeon processor can contain as many as 18 cores. The 5K 27-in. display will be powered by a Radeon Pro Vega GPU (graphics processor) with as much as 16GB of memory. Carolina Milanesi of Creative Strategies labeled the iMac Pro as having "workstation horsepower but in a traditional all-in one." Ironically, the company that treasures secrecy more than most government agencies had tipped customers to the new hardware. Two months ago, executives took the unprecedented step of responding to critics who panned the October 2016 MacBook Pro models as unsuitable for enterprise and professional tasks like video editing, engineering work and high-end design. Rumbles of discontent took hold in online forums, and were amplified by wider reports in the media that questioned Apple's commitment to personal computers. "Apple cares deeply about the Mac, we have every intention to keep going and investing in the Mac," Schiller told an invite-only group of reporters and influential bloggers in early April. In that meeting, Apple also pledged to rework the display-less Mac Pro in 2018, and to ship new iMacs this year. Some of those iMacs would be designed for the "pro" users at the advanced end of the customer spectrum. This week's announcement was the fulfillment of that promise. "The fundamental issues were more memory and more flexible options of the CPU," said Frank Gillett, an analyst at Forrester Research, of what lie at the root of last year's complaints. "They've put their cards on the table for this year." Gillett cautioned, however, that to make good, Apple has to meet deadlines. "I still have concerns about timing for the iMac Pro and [expanding the options for the] MacBook Pro to 32GB of RAM, assuming that they're still doing that. To me, that addresses [the critics] as long as they don't slip." Reports earlier this year claimed that Apple would break the current 16GB barrier for MacBook Pro memory, allowing the 32GB (or more) that some RAM-craving professionals demand. This week's refresh, however, maintains the 16GB maximum. Dawson echoed Gillett. "They're now in much better shape than they were last year," he said. 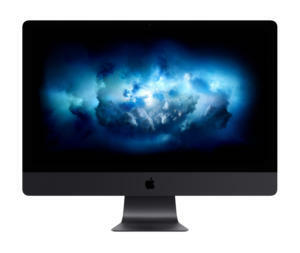 Milanesi, who dubbed the iMac Pro "a beast" and graded the Mac line-up as the strongest ever for this time of the year, agreed that the new systems would turn around the negative narrative that had built up since last fall. "The [pro segment] is a very small part of the market, but it's very important," Milanesi said, citing the theory that those customers have outsized influence on colleagues' technology choices and can drive their employers' purchasing or at least support. But Apple's trumpeting of the iMac Pro left one analyst questioning the April statement that Apple is in the process of "completely rethinking" the Mac Pro, the top-tier workstation that has not been materially reworked in three and a half years. "It's unclear if they're going to do a stand-alone, headless Mac Pro," said Gillett, when asked whether he took the iMac Pro to be a stop-gap until the Mac Pro appears in 2018. "They have to do one in order to convince customers that they're serious about [the pro part of the market]." What the Mac Pro offers -- in its current configuration -- is customization and after-sale upgrading by the user, something virtually impossible to do with an iMac. Important subsets of the professional/commercial markets for the Mac demand the modularity that the Mac Pro provides, whether adding post-purchase RAM, more storage or another high-powered GPU. "There will always be a market for a modular Mac," concurred Dawson. "But many people want an all-in-one. The iMac is already the choice of a lot of professionals in areas like video editing."